Most people know the name of John Wilkes Booth because he gained infamy for assassinating President Abraham Lincoln in 1865. Relatively few people today remember the man who helped Booth escape after the deadly deed. That man was David Herold. He was deeply involved in a wider conspiracy that had targeted not only the President, but the Vice President and other top government officials. It can be said that David Edgar Herold threw away what could have been a life of prosperity and good fortune. He was born into a well-to-do family in Washington D.C. in 1842. His father, Adam Herold, earned an upper-class living as Chief Clerk at the Washington Navy Yard. David was one of 11 children, but the only male to survive to adulthood. His mother was Mary Ann Porter Herold. David Herold received an excellent education at some of Washington’s top colleges, including Georgetown College. He earned a degree in pharmacy and got a good job working with a doctor. Unfortunately, Herold met and became involved with radical and dangerous people while in college – and this would lead to his aiding and abetting one of the most monstrous crimes in history. Herold became acquainted with John Surratt, who had worked as a spy for the Southern Confederacy and also as courier for the Confederate Army. It was Surratt who introduced David Herold to John Wilkes Booth. These three men, along with a number of others, formed a conspiracy focused on either kidnapping or killing President Lincoln, and killing other members of the President’s cabinet. All of these assassinations were to take place on April 14, 1865, and were organized by Booth. David Herold’s role was to guide yet another conspirator, Lewis Powell, to the home of William Seward, who was the U.S. Secretary of State. He did so. Powell entered Seward’s home and stabbed the Secretary repeatedly, but Seward survived the attack. While this was happening, Herold became unnerved by the commotion and fled the scene of Seward’s home. In the meantime, Booth shot Lincoln in the head at Ford’s Theater, and then made his famous escape by jumping off a balcony, at which time some historians say he broke his leg – although others say that Booth broke his leg later by falling off his getaway horse. Whatever the case, Booth was met by David Herold after crossing a bridge into Maryland. The two proceeded to a site where the mother of John Surratt, also a conspirator, had left weapons for them. Booth and Herold continued their escape, but were tracked down by the Union Army and found hiding in a barn. They were ordered to give up and walk out without their weapons. 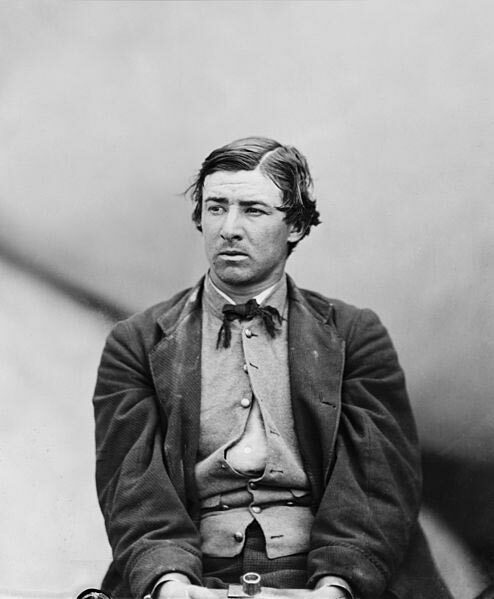 Booth refused and was shot by Union soldier Sergeant Boston Corbett. Booth would soon die of his gunshot wounds. Herold surrendered and was taken to be tried by military tribunal. Herold had next to no defense. He had previously admitted to his role in the plot to kill Lincoln and the others. His lawyer tried to argue that Herold was a simple-minded dupe who had been conned into something he didn’t understand. David Herold was found guilty and hanged on July 7, 1865. He was 23 years old.